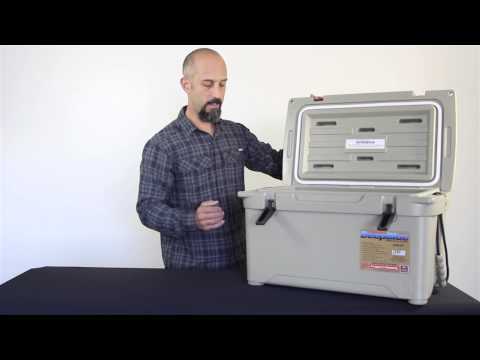 The Tough and tenacious outfitter-grade Engel DeepBlue 65 Cooler is exactly what you expect-Rugged construction, integrated lid hinge and secure draw-down latches are built for years of service. Superior insulation, airtight food-grade silicone o-ring seal and easy drainage make this the Bulldog of coolers. It's perfect for a day trip and easy to handle. Engel DeepBlue coolers are best in class for ice retention and overall performance with 2 inches of insulation all round, double the insulation of most other coolers. Available in tan and white. The Engel 65 cooler is a top notch product. It fits perfectly in the back of my truck under the bed cover and ice lasts the whole weekend. ACK was extremely quick to ship cooler out. Exceeded my expectations! Had a chance -- first time out to experience sun, rain, and a bear - survived all three with a block of ice intact for 5 days. Awesome! Got this on sale for $285.00. Only used it once so far. Filled it halfway with ice and never had to add anymore. It sat outside in the sun for 3 days on the beach in south LA. When I got home only about 20% of the ice melted. If I was using my old normal ice chest I would have had to ice every day. Will pay for itself in one year! Very happy with my New Engel 65 quart cooler! Will buy another larger cooler from ACK! Very helpful with my purchase!Fast shipping also!